Many animals move from one place to another at certain times of the year or during a particular period of their life cycle. These movements are often referred to as migration. Some animals, such as many species of insects, migrate only once during their lifetime, often just before they reproduce. Other animals, including many species of birds and many marine animals, such as sea turtles and whales, migrate long distances to their breeding grounds many times during their lives. Animals migrate for several reasons. In some cases, animals can only reproduce in a particular habitat, such as sea turtles and sea birds that must return to land in order to lay their eggs. In other instances, animals are forced to leave an area when conditions in the environment deteriorate. Many bird species that nest in Canada and the northern regions of the United States migrate south as winter approaches. The ultimate reason these birds migrate south is because their food supply (including insects and fish) will not be available during the cold months. However, these birds normally begin migrating south before their food supply has disappeared, and often even before it has begun to decline. In actuality, it is the changing length of the days (photoperiod) that stimulates hormonal and behavioral changes that result in migration. Such an environmental cue is often referred to as the proximate (or immediate) cause of migration, whereas the inevitable decline in food supply is referred to as the ultimate cause. A bird that waited until its food actually disappeared would not have sufficient body fat reserves to migrate a long distance. Thus, scientists believe that natural selection favored birds that used predictable environmental cues, such as the seasonal change in day length, to initiate migration before their food source disappeared. Seasonal migrators exhibit obligatory migration , meaning they must migrate every year. For other animals, the decline in the conditions of their environment is not so predictable. For example, owls that live in the tundra and Canadian forests feed on small rodents that are abundant some winters and scarce during others. During winters when rodent populations are high, these owls remain in Canada and do not migrate. However, if rodent populations are low, these owls will migrate down into the northern regions of the United States. Animals such as these owls exhibit facultative migration , meaning migration is optional for them. A spring tide of surfbirds surge from the mud flats of Alaska's Copper River delta. 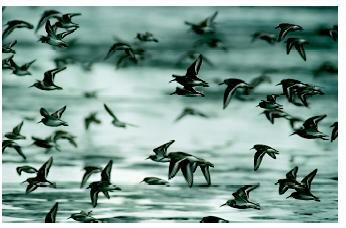 The strong-flying migrants winter as far south as the Strait of Magellan. Scientists have been fascinated by how animals are able to navigate during their migration. Studies have shown that migrating species are able to use a wide variety of mechanisms to navigate, including the stars, the sun, olfactory (chemical) cues, and Earth's magnetic field. Some species learn their migration routes by first traveling with experienced individuals, but other species are able to migrate and navigate successfully without prior experience, an ability that still perplexes scientists. Migration requires a lot of energy and many individuals die during migration. Despite these heavy costs, the potential benefits of migration are great, which is why migration behavior has evolved in so many species. Berthold, Peter. Bird Migration: A General Survey. Oxford: Oxford University Press, 1993.